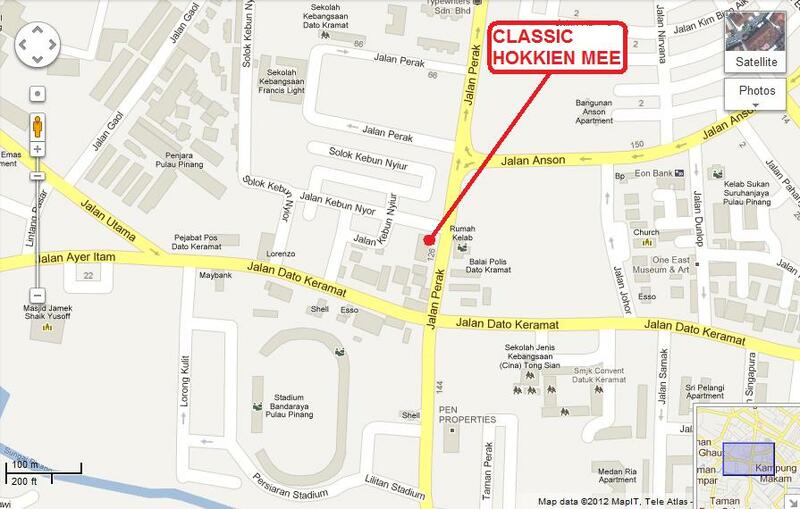 The ﻿Classic Hokkien Mee (Hokkien Prawn Mee Noodle) has been operating at Classic Cafe which was formerly a Classic Lounge in the 70s, is located at a corner unit along a row of 3 Storey Shop Office with the address of No. 126, Perak Road, Penang and not far from the Heart of George Town. In early days, this Prawn Mee Stall has no name and the local decided to named 'Classic Hokkien Mee (Hokkien Prawn Noodles)' because it operated in the Classic Cafe and it will be much easier to identify it. My advise to you that if you want to eat or try out this Classic Hokkien Mee (Hokkien Prawn Noodles), you have to be there between 8.00 to 9.30 am to avoid the food been sold out. 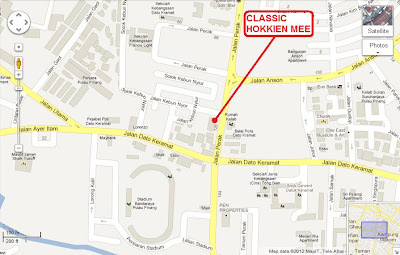 You will be surprised that when you reached the Classic Cafe, there will be a lot of waiting eager customers to be served and as you step inside the Classic Cafe, you will find that almost every customers are enjoying the Classic Hokkien Mee (Hokkien Prawn Noodles) as their breakfast or waiting to be served. For the Small Bowl of Classic Hokkien Mee (Hokkien Prawn Noodles), it is always served with Bee Hoon (Thin Rice Vericelli / Thin Noodles made from Rice) and/or the local Yellow Mee (Your Choice). The slices of dried fresh shrimps as main ingredients/garnishing with slices of lean pork meat, kangkung (water spinach), bean sprouts and crisp deep-fried shallots. It must be served with piping hot soup which is made up of the combination of pork stock and shrimp stock. The soup is semi clear with light flavor of shrimps together with the sweetness from the combination of two(2) stocks. If you want the Classic Hokkien Mee (Hokkien Prawn Noodles) to be spicy then just add a few table spoons of chilly paste to it. Well, for me i prefer it to be spicy but not to be burning hot to numb my poor tongue. I have never been to Penang, but I discover a lot from magazines that Penang is a food haven. The food were very cheap compared to Kota Kinabalu eateries. In KK, one just can't find a RM3.50 price tag for a bowl of noodles. Perhaps one can still find it in a school canteen.. (LOLs)..
Love ur blog Sam! Good review! Keep it up! Sam does a good job. Am glad to see people like you reading his blog. It promote Penang food and Malaysian food. This is the GPS location of the shop. I have been to Penang and admittedly the food is good but Singapore food is not too bad.